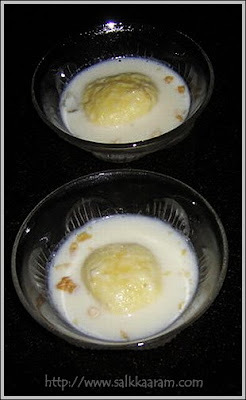 Rasmalai | Simple and Delicious ! Sieve thrice the full cream milk powder with the plain flour, and the baking powder. Add the cooking oil to it and mix well with the fingers. Then add the egg and knead well. The dough must be glossy and smooth. Make small gooseberry sized balls and slightly flatten them. In a vessel pour the milk with enough sugar and heat it. When the milk starts to simmer, add the balls 6 at a time. Keep the flame in slightly simmering condition. When they are cooked, they will immediately rise to the top. Then add the other batch. Thus complete all the balls. Turn all the balls to their other sides to cook. Now the balls will become bigger and soft. Add a pinch of saffron, pista and cardamom powder and allow the rasmalai cook for a few minutes. Cool it in the fridge and then use it. Mmmmmm I love some tasty rasmalai! Happy New Year! Seena, Rasmalai looks delicious! Very simple to prepare too. Why did my rasmalai completely break in milk. I mean all of them disintegrated. Do reply. Sreeja, I don't know what is the reason for that, did you stir it frequently? is it necessary to sieve them?